Now playing on Broadway: Miss Saigon, The Music Man, The Phantom of the Opera, and Rent. Miss Saigon - closing December 2000! 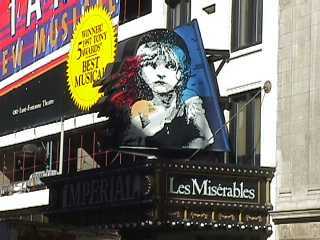 Broadway Theater, 1681 Broadway at 53rd St. (212-239-6200). $20-$80. Mon-Sat 8 PM; Wed, Sat 2 PM . 2 hrs, 30 min. One intermission. Geffen Cast album. Based on Madame Butterfly. 1975 Saigon American soldier and Vietnamese girl. Directed by Nicholas Hytner, music by Claude-Michel Schonberg and lyrics by Alain Boublil and Richard Maltby Jr.
Neil Simon Theatre, 250 W. 52nd St. (212-307-4100), 800-755-4000. $20-$85. Tue-Sat 8 PM; Wed, Sat 2 PM; Sun 3 PM. 2 Hours 50 min. Susan Stroman is Director and Choreographer. Stars Craig Bierko as Harold Hill and Rebecca Luker as Marian the Librarian. Also casted: Max Casella, Paul Benedict and Ruth Williamson. The original 1957 production ran 173 weeks and won 5 Tony Awards including Best Musical. Sleepy River City Iowa residents meet the charming con man Harold Hill who sings and dances his way into the lives of these country folk. Majestic Theater, 247 W. 44th St., Between Broadway and 8th Ave. (212-239-6200). $20 - $80. Mon-Sat 8 PM; Wed, Sat 2 PM; 2 hrs. 30 min. One intermission. Polydor, original London Cast Album. Gaston Leroux's novel, Andrew Lloyd Webber's musical set in 19th century Paris. Romance - novel operetta. 11 years running. Directed by Harold Prince. Howard McGillin - 11th Phantom. Nederlander Theatre, 208 W. 41st. St. Between 7th and 8th Ave. (212-307-4100).$35-$80. Mon, Tue, Thu, Fri 8 PM; Sat 2, 8 PM, Sun 2, 7 PM. 2 Hours 45 min. One intermission. Dream Works Records cast album. Based on Puccini's La Boheme, rock musical tragedy. Set in Lower East Side. Directed by Michael Greif. Or, give to your local Salvation Army. Please help those less fortunate than ourselves. Make a habit of giving regularly to charity.